So here’s a thing. That previous NYT piece on the closed pension that wanted to exit Calpers (and then did) talked about needing more money than what they were charged on a going-concern basis. That plan sponsor did ultimately pay the money to Calpers and exit, so the handful of retirees from that plan should be getting 100% of their promised payments via Calpers. That was the orderly exit, and yes, it was expensive. But here’s another way it can go: reduced benefits when you can’t pay the exit fees. So yes, it is an option to stop paying Calpers. And Calpers will reduce retiree benefits in line with that. Again, Calpers shows what it thinks the pension promises are really worth when somebody exits. I don’t necessarily have an issue with that valuation. I have an issue that they didn’t recognize that value all along. At the time of that piece, nothing official had been decided yet. SACRAMENTO, CA – The Board of Administration for the California Public Employees’ Retirement System (CalPERS) today declared the city of Loyalton in default of its obligations to CalPERS after failing to pay what it owes to fund its pension plan. The decision means that Loyalton’s retirees will see their benefits reduced in accordance with California Public Employees’ Retirement Law. - Once it was determined that Loyalton could not legally rescind its voluntary termination, a final collections letter was sent on December 15, 2015. After receiving no payment, a final demand letter was sent in August 2016 requiring Loyalton to bring its account current within 30 days or be declared in default. In addition, a certified letter explaining CalPERS’ proposed action to reduce benefits was sent to the four affected retirees and one individual who no longer works for the city but does not yet collect retirement benefits. Under Government Code 20577, the Board can reduce member retirement benefits from the date of contract termination in proportion to the amount of the employer’s deficiency in paying its required contributions. In Loyalton’s case, the reduction could amount to a 60 percent reduction in benefit payments. I highlighted the bit that does indeed show that Calpers is allowed to cut benefits. We see that there are five people specifically affected by this change, so it’s obviously a fairly small locality. - What’s next for Loyalton and those five people? - Which towns will follow Loyalton into just stopping being in Calpers and having the retirees/vested employees take the blow? Calpers probably knows that second item far better than I do (and if they don’t, they should probably hop to it.) I wouldn’t be surprised if there are local governments in California whose only debt is to Calpers. But bankruptcy is a specific legal process. Just defaulting on payment is not. The division continued yesterday after the CalPERS board was told the Loyalton city council voted the previous day to make payments from the city budget to replace the roughly 60 percent cut in the pensions, ensuring that retirees receive 100 percent of the promised amount. Loyalton Councilwoman Patricia Whitley, a former mayor who voted to leave CalPERS, said the council voted unanimously this week to offer the retirees a supplemental city payment to restore their full pensions. Loyalton Mayor Mark Marin said there was no vote at the council meeting this week, only an understanding, and he was skeptical about the retirees accepting the proposal. Note: they are already screwed. Marin said some of the retirees are talking to an attorney about possible legal action. A CalPERS staff report said there is a risk that a pension cut could trigger an employee lawsuit against the city requiring CalPERS involvement. Whitley has said a 50 percent pay raise that may not have been legitimate increased the cost of unaffordable pensions. The CalPERS report said Loyalton generously increased its pension formula to “2.7 at 55” in 2004, more than the “2 at 55” for most state and school workers. Marin said he has been told that the vote to leave CalPERS may have been illegal because it was done as an “emergency” action. He said city council members wanted to divert the pension contribution to a city museum and other uses. Okay, so perhaps other towns may not follow Loyalton over the cliff, if the legal issues do persist. A DIGRESSION: WHY DOES LOYALTON HAVE A MUSEUM? They’re not kidding – they’ve got a museum. Looks like the volunteers aren’t much into updating webpages. I also notice that the files aren’t exactly… current. Or copious. The last notice was from February 2016. Anyway, this town of 750 people is even smaller than my own town in New York (5,000 people-ish). We’ve got a historical that’s somewhat active, but I’m pretty sure we don’t have a museum. Our society mainly goes around to fairs and shows off documents and refurbish cemetaries, and that sort of thing. So I don’t know how active this museum is, or what kind of funding they were going to try to feed it. Some nice artifacts, though. Okay, let me not get too sidetracked by the museum (wtf) issue. So Loyalton is very small, may have questionably boosted pensions for its tiny staff, and if they couldn’t pay enough for future benefits, I’m wondering if they really can support pay-as-you-go. That said: are other towns in a similar position? How many people would that be? So I took a look at this set of data, and one category is towns below 1000 in population. So if they each had 5 covered people, that’s still under 1500 affected people. That’s not even 0.1% of Calpers. So the first-level estimate is that all of these small towns could default, and it’s equivalent to a rounding error. To be sure, Calpers doesn’t really want to let towns think they can default with impunity, but with these smallest towns, there’s not much leverage to be had. They probably don’t have much in the way of bonds, and if they’re broke, they’re broke. Now after a lengthy bull market, most experts are predicting a decade of weak investment returns, well below the annual average earnings of 7.5 percent that CalPERS and CalSTRS expect to pay two-thirds of their future pension costs. The two systems are still seriously underfunded, CalPERS at 68 percent and CalSTRS at 65 percent. This is not money in the bank. It’s an estimate of the future pension costs covered by expected employer-employee contributions and the investment earnings forecast. Last week, the CalPERS and CalSTRS boards got separate staff briefings on how the “maturing” of the two big retirement systems creates new funding difficulties. Both are nearing a time when there will be more retirees in the system than active workers. The California State Teachers Retirement System board, for example, was told that in 1971 there were were six active workers in the system for every retiree. Today CalSTRS only has 1.5 active workers for every retiree, similar to the CalPERS ratio. It’s not only actuaries who call it that. FWIW, the oldest boomers turned 65 in 2011, but then public employees could retire younger than 65. That wasn’t really much of a wave. It’s the peak births in 1957 that will drive, and they’re turning 60 next year. I went looking to see if I could find some census of Calpers members, but that does not seem to be publicly available. Seems to me there’s a secular pattern here, and it doesn’t seem to me that it corrected itself. We had multiple years of a bull market in recent years, and the funded ratio has barely recovered. 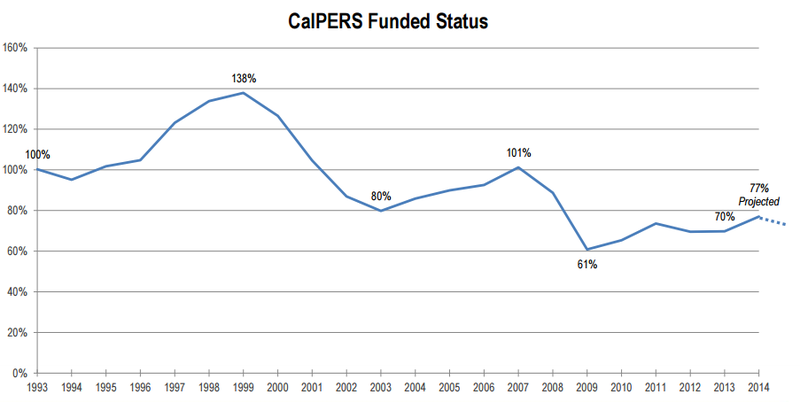 CalPERS was 100 percent funded in 2007 before the stock market crash dropped funding to 61 percent. Experts have told CalPERS, now only 68 percent funded, that if funding drops below 50 percent getting back to full funding could require impractical rate increases and earnings forecasts. The board was told that a rate increase must be approved by April to take effect for the state and schools in the new fiscal year beginning next July and for local governments in July 2018. Supporters suggested a rate increase by April would allow a phase in before a recession, if one is on the way, while being fiduciarily responsible. “Pay now or pay more later,” said board member Richard Gillihan, a Brown administration official. Alarmed union representatives, backed by some board members, urged the board to go slow and follow the regular two-year process leading to a full “asset liability management” review scheduled in 2018. The legislation gave the CalSTRS board another new power to annually adjust school district rates beginning July 1, 2021. But the employer rate is capped at 20.5 percent of pay, allowing only small changes in the phased-in rate reaching 19.1 percent by 2020. “There is no need to increase state contributions further, based on what we have seen to date, even with the 1 percent return last year,” David Lamoureux, a CalSTRS actuary, told the board last week. The CalSTRS board is scheduled to review “actuarial assumptions” in February, including estimates of the average retiree life span and probably a discussion of the earnings forecast. “There is a possibility, depending on where we end up with the assumptions, that it could trigger an increase in the normal cost of more than 1 percent (of pay), and it could increase the member contribution rate,” Lamoureux said. So, both Calpers and Calstrs are looking at possibly increasing contribution rates, partly by updating their valuation assumptions. Because supposedly 100% contributions have been made to Calpers, and in the case of Calstrs, the contributions have been inadequate for years and have only been getting worse. Anyway, I can imagine some smaller towns just assuming they’re screwed no matter what, and quit throwing money into Calpers. If they can’t make the increased contribution rate, they will definitely not be able to afford the termination. As noted above, the impact from the smallest towns will likely do little to Calpers as a whole. The trouble comes when larger employers and more people are affected. Think of Detroit, but scaled up to California. So Calpers would like this not to spread, I’m sure. Making a public example of Loyalton at least points out what the stark choices are. But then, if the towns can’t meet either increased contribution rates nor the termination fees…. there may not be much of a choice.